​Tottenham Hotspur will attempt to continue their title challenge as they face mid-table Leicester City in the Premier League at Wembley Stadium on Sunday. Mauricio Pochettino's side have barged their way back into the title discussion after three straight Premier League victories. Leicester City's form is a complete contrast to their hosts however, as they have not won any of their last four league games. Despite the Foxes coming into the game out of form, Tottenham will be wary of the Midlands club's terrific record against the Premier League's top clubs, having beaten Manchester City and Chelsea and drawing at Anfield. Here is 90min's preview of ​Sunday's Premier League clash. Tottenham's injury list has been shortening gradually over the last few weeks, and Tottenham could scratch off another name as they may see full-back Ben Davies return at Wembley Stadium on Sunday. The Lilywhites, however, will still be without two key players for the visit of Leicester City. Despite making positive steps in his rehabilitation, club talisman Harry Kane is expected to remain sidelined with a torn ankle ligament until the end of February. Footage from Dubai of Dele Alli resuming training after a hamstring injury will have made for encouraging viewing for Spurs fans, as the England midfielder is working on a return to action. It may be another month until the 22-year-old returns to action however. Claude Puel will only have a couple of injuries to contend with when he selects his team on Sunday. Marc Albrighton missed Leicester's loss against Manchester United, and is expected to miss out again on Sunday with a hamstring injury. Ghanaian midfielder Daniel Amartey remaining the Foxes' only long term absentee after suffering a broken ankle against West Ham in October. In a history of matches dating back to 1914, Tottenham have had the better of the 111 matches between the sides, with the North London side winning 55 compared to 33 victories for Leicester City. 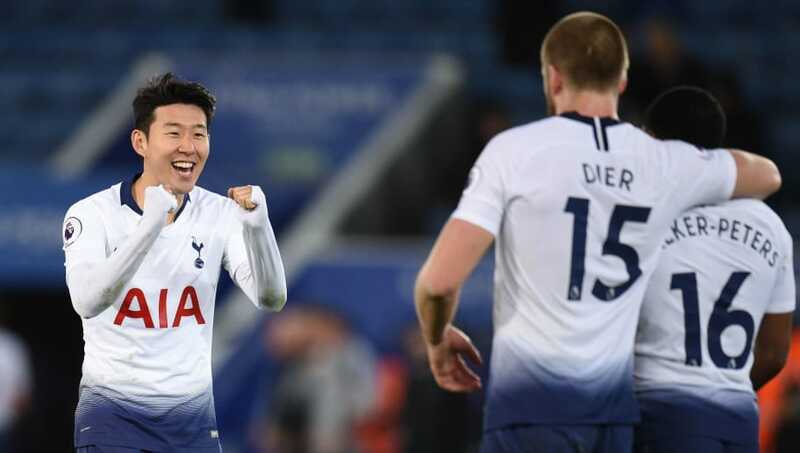 In the latest fixture between the teams, which took place at the King Power Stadium in December, Tottenham defeated Leicester 2-0, thanks to goals from Son Heung-min and Dele Alli. If history between the sides is anything to go by, then it should be an entertaining affair at Wembley on Sunday, as there has not been a goalless draw between the teams since 1948. This game may, however, have a hard task to live up to Tottenham's 5-4 win at home to Leicester on the final match week of the 2017/18 season. Tottenham have responded terrifically since their disappointing 1-0 defeat to Manchester United at Wembley, taking maximum points in their last three games; a run which now sees them sit only five points from the top of the table. Late goals have been a feature of recent Tottenham matches in the Premier League. This continued in their last game, which saw them patiently see off a dogged Newcastle United, after a late Son strike secured a 1-0 win for the Lilywhites. Leicester City's form of late has seen their manager Claude Puel come under increasing pressure at the King Power Stadium. The club have not won a match since victory against Everton at Goodison Park on New Year's Day. Defeat against Manchester United last time out saw the Foxes drop into the bottom half of the Premier League table. Leicester City will unsurprisingly look to play on the counter attack on Sunday, they will defend in numbers and look to break forward quickly with pace when the opportunity arrives. This will be familiar to Spurs, as Newcastle and Watford both executed similar tactics at Wembley recently. Another patient and composed performance will see Tottenham just edge this one. It may take a Leicester breakaway goal however to spring them into life.